Reid Melillo has the speed to make things happen on the lacrosse. He also has the smarts to go with it. The combination of those attributes makes the Class of 2015 standout at Wilton High School (CT) one of the most versatile midfielders in the Fairfield County Interscholastic Athletic Conference. He hopes the same thing can be said when he starts play in the Old Dominion Athletic Conference (ODAC) with Roanoke College. 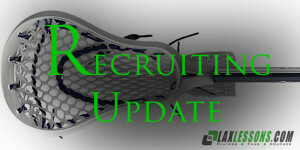 The 6-foot, 175-pound righty’s commitment to Roanoke was first reported when it was made by Joe Lombardi on LaxLessons.com’s Lacrosse Insider premium coverage section. You can watch his highlight reel here. The main factor was the academic reputation. Second, I wanted to go to a school that had a strong history of winning. Lastly, Head Coach (Bill) Pilat and Assistant Coach (Justin) Tuma treated me extremely well throughout my recruiting process. I was considering Ohio Wesleyan University, Franklin & Marshall College, United States Merchant Marine Academy and Babson College. I visited Ohio Wesleyan and Franklin & Marshall. I would say my speed and lax IQ. I would describe my style of play as unselfish and smart. I think the area of my game that I need to work on the most is my shooting. I have been playing lacrosse ever since I can remember. My brother, Connor, who plays at Franklin & Marshall College introduced me to the sport at a young age. I also ran indoor track up until my junior year. I play on the Connecticut Chargers in the summer and Warrior Pride in the fall. I participated in Crabfeast, Baltimore Summer Kickoff, Philly Showcase, Super Sophs, National Invite 175, and Blue Chip 225. First and foremost, I would like to thank my parents for the endless hours taking me to numerous tournaments and showcases, they have always been behind me no matter what. I would also like to thank my Chargers Coach, Jackson Kiniry, he has done so much for me and I could not have asked for a better coach. Lastly, I want to thank Coach Pilat and Coach Tuma at Roanoke College for this amazing opportunity. I cannot wait to work hard and be a part of the team.